I am interested in Patrick BARRETT (1793-1889) and Ann Flynn (1804-1888). Noticed them on your webpage. Three Barrett brothers may have come from Kilbride, County Mayo and show up on the 1829 McCabe List. Cantley, Quebec, St. Elizabeth Catholic Church, buried 02 Jan 1891 in Cantley, Quebec St. Elizabeth Catholic Church. Notre Dame Cathedral, Ottawa, Upper Canada, b. in Doonfeeny, Co. Mayo, Ireland. He married (2) Ann Flynn, b. 1804, d. 12 Jun 1888. Ann: In 1881 she was 75 living with her husband at their son's farm. i	Catherine Barrett, b. ca 1836 in Quebec. ii	Mary Barrett, b. 1838, d. 20 June 1874 in Quebec. 2.	iii	Thomas Barrett b. 14 Apr 1845. 3.	iv	Ann Barrett b. 1847.
b. 6 May 1850 in Quebec. 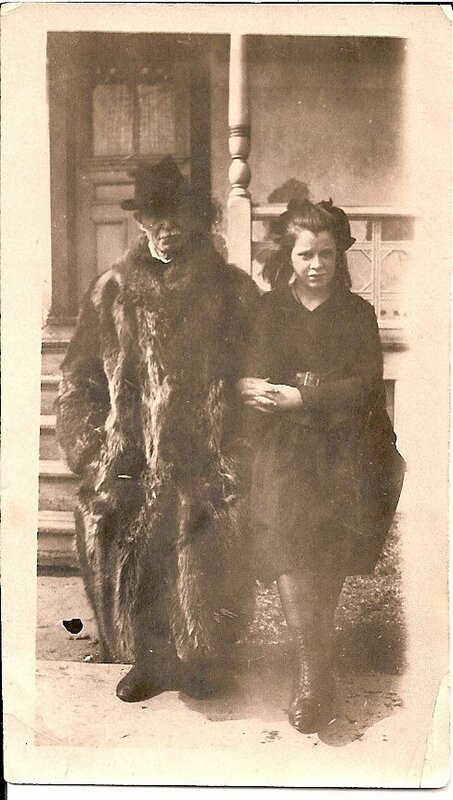 Mary Lynott, (daughter of William Lynott and Hannah McManus). ii	Hannah (Anna) Bridget, b. 26 Dec 1877 in Quebec, d. 1965 in Quebec. She married Charles Prudhomme, b. 1878, d. 1965.
iii	George Barrett, b. 26 Aug 1879 in Quebec, d. 29 Sep 1926 in Quebec. iv	William Barrett, b. 19 Sep 1883 in Quebec, d. 15 Jan 1901.
v	Thomas Barrett, b. 9 Aug 1884 in Quebec, d. 12 May 1934. Catholic Church, b. 1901 in Quebec, d. 9 Oct 1974.
vii	Thomas Barrett, b. 23 Jan 1882, d. BEF 1884.
living Hull, Ottawa, Quebec 1881.
i	Marie Cashman, b. 1875 in Quebec. ii	Bridget Cashman, b. 1877 in Quebec. iii	John Cashman, b. 1879.
sure of Charles Prudhomme's death but it was in the mid - late 1950's. This has got me interested in nailing down the relatives however! BURKE and Ann FLYNN. I wanted to reply directly on the site but could not figure out how to have my comments appear. me know your thoughts as I have sources for all my info but perhaps there are errors. I am the grand-daughter of James Eulic BARRETT, b. Dec 23, 1887.
married on June 11, 1922 in Almonte, Ontario. They had four children. and Anna dying June 13 and being buried June 15, 1888 in St. Elizabeth's Cemetary in Cantley, Que. 8 children, that I found. There could be others but those are the ones I know about. and want to be sure I place her correctly. I have most pertinent info on their 12 children but need to know where she goes! If any of you, or anyone else you know, has info pertaining to the aforementioned people I would love to hear from you. Please feel free to contact me at jbarrett@noos.fr. You can also feel free to post this on the Bytown.net site. and I believe her mother was Sophie Flynn. Mary Barrett and Felix McGrath are both buried in St. Stephen's at Old Chelsea. (Ottawa) and that there was a Doctor Barrett had a place at Meach / Meech Lake. Does any of this mean anything to anyone? and harness making for John (Buffalo) Heney. Peter made long-legged leather boots for the Ottawa and Gatineau river lumber firms, such as Logue and the Hamilton Brothers. other companies if Peter was an employee or contractor. Mary SMITH. This article states Peter came from Castlebar, County Mayo, Ireland and settled in Bytown around 1827.
them but died en route. I have several other articles written over time on various members of the Barrett family, again without dates and sources. information on Thomas and scant info on Peter and almost nothing on Dominic. I look forward to our next exchange. in 1938 at the age of 104 years. immigrants so it is highly likely that the Barretts were from County Mayo. family of Templeton. Some of this may be helpful. Maria (a.k.a. Mary) Smith. I saw your posts on the Barrett web page. Ellen O'Hagan, and Annie M. O'Hagan. Elizabeth Ellen is my great grandmother. to confirm, generally, what I see here—namely the locations of marriage, birth, death etc. The family is confusing. Elizabeth Barrett's Husband, Francis died when he was quite young—33 years old. She then remarried John Patrick Cosgrove. It was children of this marriage (Cosgrove) that married into the Gorman family. The issue is confusing because John Patrick Cosgrove's first wife was Elizabeths sister, Ellen, who also died quite young. including one of Elizabeth Barrett, and a painting of Francis O'Hagan (of no interest to you, I'm sure). The Hutchingame family was in the Bytown area beginning in the 1840's. Please include my name in the future on the Barrett email list. My great-grandmother was Mary Barrett wife of Felix McGrath and daughter of Domink Barrett and Sophie (Flynn) Barrett. not know the circumstances of their deaths in the same year. Further research is needed. 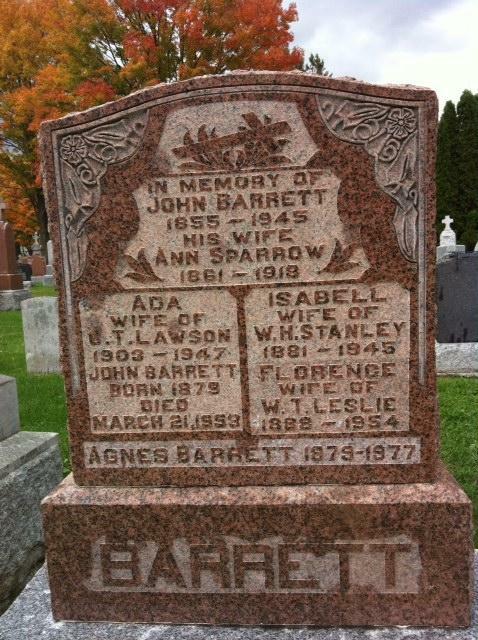 I came across the site http://www.bytown.net/barrett.htm and my great great grandparents are Thomas Barrett and Mary Lynott. it to you. If anyone has more information about Patrick Barrett (b.1793/1799), his parents, or his siblings, I would appreciate that. I am the greatgreat grandaughter of Peter Barrett. 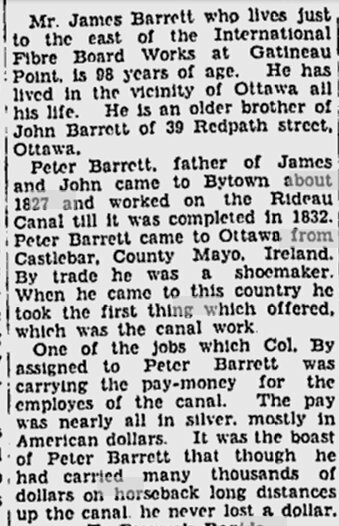 My grandfather was John Barrett who was the son of John Barrett who was the son of Peter Barrett. I would be interested in being added to the e-mail chain. I learned a lot of my family on Bytown or Bust. Thanks for the link Mark. I have attached a picture of John Barrett senior. Does anyone know who the girl is? Buella but I may be wrong on that. I believe was about 42 years old when she died. I know a few things about the Barrett family, if anyone is still interested. he contributed material to our web site. Also feel free to send along any old photos, information, etc. regarding the Lawson family in the Ottawa area. Hello! I am so delighted you responded! My dad would be so happy! PLEASE add me. I hope I can help fill in any gaps. Blvd in Ottawa (Notre Dame Cemetery).
" two solitudes" - English/French. so perhaps he/she has a new email address. were brothers, Peter (yours) and Patrick (mine, oh and Julia's (February 28, 2006)). I believe that their parents were James Barrett and Bridget Larkin. So, how did I come to this conclusion. The 1871 census shows Mary Barrett living with Patrick and his wife. 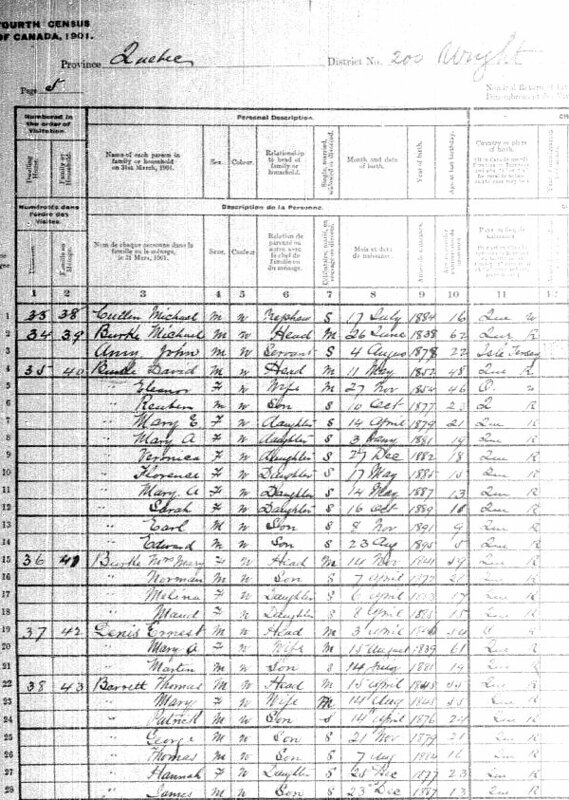 The 1881 census shows Mary Barrett living with Peter and his wife. as her parents. She died at Peter's residence on the 30th. Pat and Peter signed the register. You mentioned that Ada had 3 sisters. I checked the census for 1891, 1901, and 1911. I've found Isabella, Florence, Rhea, and Ada. Her brothers were John, Arthur, Ambrose, and Edward. I'll try to get in touch with Julia Barrett. She changed her email in 2008. I spoke with her Aunt Kay just a short while ago. She mentioned Kay in the 2006 post. Has anyone found out anything about Dominic Barrett? been Patrick) on the Brutus in 1833.
the Brutus "Pray to be released from Quarantine or for relief if detained". One of these days I will go to the archives and see the whole thing. I will tell you if I find anything. (great-granddaughter of John Barrett, great-great-granddaughter of Peter Barrett). Somehow, I seem to have been dropped from the Barrett mailing list on Bytown. Would you be so kind as to add me again? I am the great-great-granddaughter of Patrick Barrett and Sarsh (Sally) Burke. My mother Nora Barrett (John junior's daughter) often mentioned her aunt Rhea and her cousin somebody Baxter. We are descendant of the Barretts who settled in the Kilbride area of County Mayo in Ireland. with other lands in the district. in the townland of Kilbride and Peter Barrett living in Lower Carronedin. Bridget Larkin as her parents. She died at Peter's residence on the 30th. Pat and Peter signed the register. great grandfather on my Dad's side. Their daughter Hanora McAndrew married Michael Flynn. with 3 males, 2 females. There is also a land grant for Richard in 1844 for 104 acres. If anyone can shed any light on Mary Barrett, the McAndrews or the Flynns from Mayo I would be very appreciative.